You have to really look to find red flowers here at May Dreams Gardens. In fact, as far as I know or can recall, there are no red flowering plants of any kinds amongst the perennials, trees, and shrubs. Most years, as a matter of fact, I don't even get red flowers for the containers. But I did buy this dwarf canna the other day, figuring it would be red-flowering, even though it had no bloom or tag when I bought it. I thought it might help attract hummingbirds. But look what I planted around it. Those are pink, purple and rosy colored verbena. Now, those are flower colors! 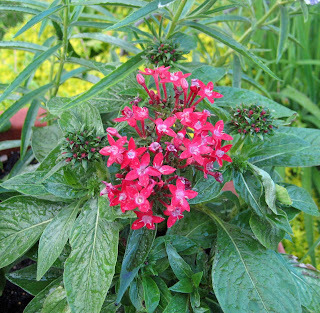 Near my new hummingbird feeder, I also gave in and planted this Pentas 'Butterfly Red'. I do like things that are red when they are in the vegetable garden. I've picked about five dozen strawberries between yesterday and today out of my little 4' x 8' patch and there are more ripening daily. I hope by mid-July I'll also see some red tomatoes in the vegetable garden, instead of just seeing red when the rabbits eat something they shouldn't or that neighbor's cat does his business in one of my raised beds. The only other red flowers I have are these impatiens. I'm almost, but obviously not quite, embarrassed to show these, since I just planted them rather hastily this evening, trying to get the last of my plants potted up, and they look a bit rough. But we all know they'll fill in nicely. How did I end up with red impations, you ask? For some reason, I got a packet of Tutu Impatiens from Pinetree Garden Seeds with my one of my seed orders. I don't remember ordering them, but I could have. The packet said it was a mix of rose, peach, and red flowers, but I sowed the seeds anyway, taking my chances that I'd end up with rose and peach colored flowers. I ended up with all red flowers. I decided to dedicate them to one of my fellow garden bloggers who couldn't believe I avoid red flowers in my garden. In response to one of my comments on Digging about how I avoid red flowers, Pam, the author of Digging, left me a comment and I quote, "You avoid red?! Can it be so? Red is one of my favorites in the garden (and elsewhere). But I’m fond of purple and yellow too." 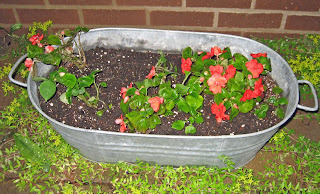 So, Pam, this isn't exactly one of your famous stock tank planters, it's just an old metal wash tub, with holes drilled in the bottom for drainage, planted with some of the only red flowers at May Dreams Gardens. I thought of you when I planted it up. I hope you like it. Does anyone else have a particular flower color that they avoid in their garden? Don't tell me I'm the only one who does this! The impatiens story is pretty funny, Carol - how many times a bag or packet of 'mixed colors' means only one or two! Until the middle 1990's I had very few red flowers either, Carol -going for pale pinks and peaches, lilacs and blues and pale yellows. Then I decided to make a 'Hot Border' next to the west-facing, long blacktop drive, and I put in red monarda, red daylilies, Maltese Cross, etc. I planted pineapple sage which sometimes managed to bloom before an autumn freeze killed it. 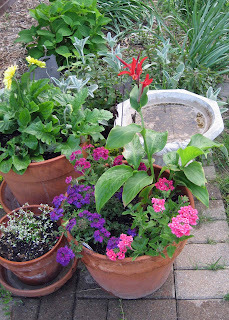 Down here I also started out with more sedate colors, and have consigned the hot pinks to the Pink Entrance Garden, but once I saw the first hummingbird began to add lots of red flowers. 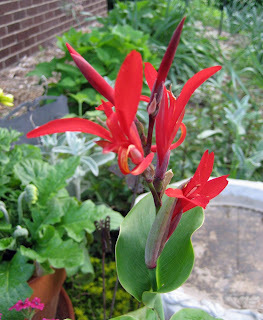 So your red canna looks pretty tempting to me! I don't think I avoid certain colors as much as I gravitate toward others. The purples and blues are the most common one's here with some yellow and orange. There is very little red but I'll probably add more as I go. I do want to add more red daylilies. 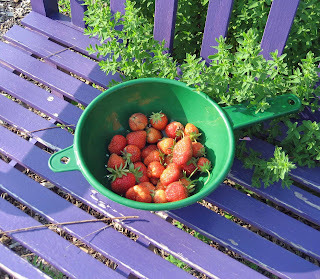 It is patently obvious to any regular visitor to my blog that I don't avoid any colors in my garden. I guess my philosophy is the more the merrier! I posted some pictures of how my vegetable garden is doing today, plus a few shots of the front. Hope you have time to stop by. I avoid 'school bus yellow'. I do have black eyed susans though I don't really like that color at all. Just SBY! All other colors are welcome here! Too funny about your seeds. I don't purposely seek out red flowers but they seem to find me. I can't believe how many reds I have and when they bloom together they do clash. Worse, my favorite flower colors are blue and white...so sometimes I look like I'm gardening for the 4th of July. I am attracted to deep, dark blood reds and shy away from fiery orange reds. I've learned that whether I like a red or not depends a lot on the texture of the flower. I do avoid certain flower colors: pale blue, pale pink, and peach. They're all pastels, now I think about it. My gardens would look much better if I'd eliminate some colors, but which colors? I can't decide. Red is a particular favorite, but most of my reds come from annuals. However, last year I planted Park's Pastel Mix of zinnias and most of them turned out bright red. bee balm in my hummingbird garden because they really attract the little hummers!Natureboy planted some tomatoes so more red this year! When we were in Arizona this past winter everywhere are RED flowers and among the desert gardens it looks wonderful...POPS out at you! It also complimented all the red clay tile rooftops too! I guess red in our gardens can be striking! I'm red/green colorblind, so for me red is often one of the least interesting colors in the garden. I just plain can't see red flowers against green foliage. Blue is the color that really pops out in a garden so it tends to be my favorite. And I really don't like colors like pink and pale yellow. However there are other considerations. I like to attract birds and bees, but I can't grow anything that is palatable to deer. And everything must be able to survive a hot dry summer without artificial irrigation. So picking plants on the basis of flower color is a luxury I don't have. I didn't realize it until you asked and I did a mental walk through the yard, whew, I found the Salvia greggii...it is a brilliant red and for some reason looks wonderful out there with all the other colors...I totally get Entangled's color dilemma! I've always been attracted to pink and purple flowers. They are definitely my favorites. However, now that I'm gardening to attract butterflies and hummingbirds, I'm adding more red to the garden. No orange - never, ever, nuh uh, not gonna do it. Nothing with any hint of orange either, meaning no peach, no orangy yellow or tomato red. I just don't like it. Red, yes I think that's the only color I avoid in my garden. Not because I don't like red flowers, I actually like them a lot, but I just can't seem able to make a good color scheme usig red. The one red flower worth having in my garden is Crocosmia Lucifer. I have a big patch of it and am going to divide it and spread the colour around the garden. Annie in Austin, I wonder if I'll end up with more red flowers each year as I try to attract more hummingbirds. I still had some poinsettias with red bracts, so I set them out by the canna this evening. Dave, I think that's more how I am. I gravitate toward colors I like and red is just not one of those colors. HealingMagicHands, I will definitely take time to 'stop by' and see your gardens. Layanee, Hmmmm, School Bus Yellow. Would that include the Stella D'Oro daylilies, because I have a lot of them. MSS @ Zanthan Garden, Yes, I remember your post about the red coral bean flowers, right? And different reds do often clash, at least to me. Pam/digging, Even without the beautiful pastel colored flowers, your gardens are always beautiful. Entangled, Except for red, I can find most other colors in my garden, but like you, I'm not sure what I would get rid of. NatureGirl, I agree, red in the right kind of garden setting can really "pop" out at you and be pretty, if you like red. Bill/Prairiepoint, Well, at least I can see all the colors, and pick most any I want. You do have some gardening challenges! Gail, So you only have one red flower? Robin's Nesting Place, Red is becoming quite popular! Mr. McGregor's Daughter, Lots of laugh, don't hold back, tell us how you really feel about orange flowers! Gintoino, I agree, red can be difficult to work into some color schemes. Zvrk, I'll have to look that one up! Thanks all for the comments on red flowers. PINK!!! ARGH, but pink is the bane of my non-girly existence... lol. And I swear that many of my edible plants (cherries, elderberries, etc.) flower in pink just to spite me. Right on the tails of pink is yellow, but I'm learning to make friends with a few buttery shades of that. There's no hope for the pink, though! I graviate to certain colors more than avoid colors. This year I have bought more voilets and purples annuals than any other color. I love your planter with the dwarf canna. Carol, I hardly think about the color of blooms in the garden. I think mostly of the foilage. I think your red canna is pretty as well as the impatients and penstemon. I find myself looking at a flower and thinking: "humm. I don't think I have that color yet..."
Well, I was the one who promised myself the biggest box of crayons that I could get when I was a little girl...and I kept that promise when I was an adult. Seems to have carried through with my garden. Hmmm. 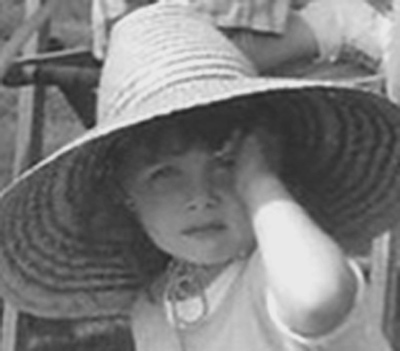 There may be a blog post in that for me too. Needs some thinking. I'm also a no-orange person...although I was a no-yellow person and I've found some soft yellows showing up in the garden the last few years. Red only in the winter...I like it then because it stands up to the gray, foggy days. But come spring I prune off the nandina berries, as well as most of the cotoneaster berries...they clash with the 'good' colors that start to show up. I avoid red, too. With two exceptions: the "firecracker" heuchera that are blooming right now and look great with chives, nepeta, baptisia, lemon lilies (just finishing), dianthus... Later in the summer, when the hostas are in bloom (lots of lavender there) the "Pardon Me" daylilies, which are dark red provide a terrific color contrast. I like some red in the garden, but more as an accent. I am careful how much and where I place it. I do love red poppies in with the pinks and whites, and red Bee Balm and red Zinnias. This year I started Scarlet King zinnias, but will confine them to their own area. Every color is beautiful to me, when it is being worn by a flower! I'm going to wait for everything to bloom in my garden before I figure out what I don't like at this new house. I got a little seed happy and don't know what's coming up yet. I did have plan. I tried to plant in masses of color and do a real southern charm thing---we'll see??? I think everything you do looks good. I read your post above about houseplants too. You know--I don't have a single one. I think it's cause my season of outdoor plants goes for so long that I never get around to the indoor plants. My problem is that I like red and yellow both but hate them together. Well, they end up together because the garden is so small. I also need to cease and desist from adding any more purple. What does that leave? Pink? Blue?